TT: [Treewiddle Tribune] We usually interview students one-at-a-time but since you two insisted you be interviewed together we’ll just have to figure it out as we go along. LIZZY: We do almost everything together so it’s no big deal. I’ll be doing most of the answering anyway. KIZZY: Yea: Lizzy will do most of the answering. TT: Ok. Let’s start by hearing a bit about yourself … um, yourselves … the both of you, I mean … Just start talking, please. LIZZY: Sure. 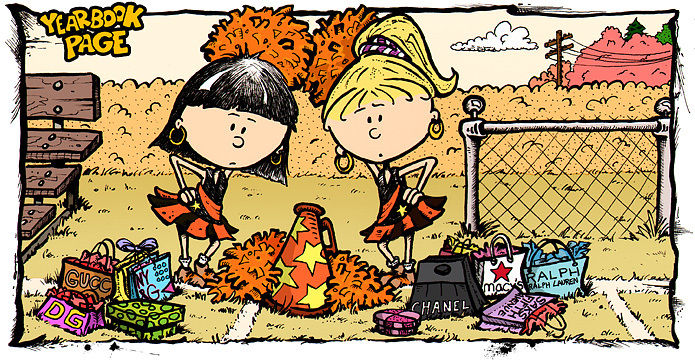 My name is Lizzy – I’m the brunette – and Kizzy here is my best friend; she’s the cute blonde. We’re both cheerleaders but I’m the Captain. Shopping is a super important part of our lives but so are hot cars and hot boys. We’re like one great woman split in two and everyone considers us the prettiest girls here at Treewiddle, maybe even the whole State. KIZZY: Yea: Prettiest girls in the whole State. TT: Are you two involved in any academic extra-curricular activities? LIZZY: Kizzy isn’t but I’m a reporter for the Treewiddle Tribune website. I report on school events and activities. KIZZY: Yea: Lizzy writes for the website. TT: List two strengths and explain each one. LIZZY: We have a lot of strengths but since you only want two – One strength we have is we’re both very determined girls. We know what’s important in life and how to get it. You have to be focused so idiot boys and jealous girls don’t get in the way. Our second strength is that we don’t take “no” for an answer. People who take “no” for an answer never win. KIZZY: Yea: We don’t take “no” for an answer. TT: Does the school give you too much homework? How much do you think they should give? LIZZY: No. If anything the classes are too easy. The boys are really dumb here and sometimes it’s embarrassing to be in the same classroom as them. I think they should give stupid boys more homework so they can catch up to the girls. KIZZY: Yea: Boys are stupid. TT: Speaking of boys, is there anyone in school you have a crush on? LIZZY: Definitely Winslow. He’s the only boy who isn’t dumb. He likes me too but he’s too intimidated by my good looks so he doesn’t show it much. I pretty much ignore all the others. KIZZY: Yea: Her beauty scares him. TT: How do the other boys react when you ignore them? LIZZY: Their little hearts probably break, then they probably cry, but they probably get over it … except for this boy Conrad; he’s always trying to get my attention and he never gives up. He’s not my type at all though so it’s kinda’ irritating. TT: Describe your philosophy of life, if you have one. LIZZY: If a girl is always smart, looks hot, and never gets old and flabby she’ll have a good life and get whatever she wants because pretty girls always get what they want from boys. Just look at Hollywood stars and movies; It’s true. KIZZY: Yea: It’s wicked true. TT: What do you think about kids your age smoking cigarettes, using alcohol or drugs? LIZZY: Ultra-Girl magazine says those things make your face look older so it’s stupid to use them. But I did read that smoking can make a girl skinnier so we’ll probably smoke if we start to get fat. KIZZY: Yea: We’ll smoke if we get fat. TT: You two girls certainly seem to know what you want out of life. LIZZY: Yep. Girls rule! Use any means necessary to get what you want. KIZZY: Yea: It’s necessary to be mean! KIZZY: Yea: Whatever she said. TT: Thank you for your time today, girls. It’s certainly been an eye-opening interview. LIZZY: No problem. Don’t worry, we have that effect on people.